I haven’t shopped for anything but basics for years – black, brown and grey pants, skirts and shirts; home t-shirts and shorts; the necessary underneath things. Everything else I wear has come out of Grandma’s cupboard. Grandma was a Peranakan matriarch, a real clothes horse. The photo on the left shows how women of her generation dressed. Grandma was really into clothes, even when she was well past seventy. When she passed on, she left us a cupboard full of fifty or sixty co-ordinated sets of hand-cut and embroidered cotton voile tops and hand-painted batik sarongs. Now a Peranakan costume is an exercise in flexibility. The top can be worn pinned as a blouse or loosely over a tank-top or t-shirt. As for the sarongs, you can wrap them around your hips, make them into a pareo, or simply drape them around a long black dress like an exotic stole. In short – Grandma’s wardrobe, her at least half a century old tops and sarongs, have become my go-to resource whenever I need to dress up my basics. 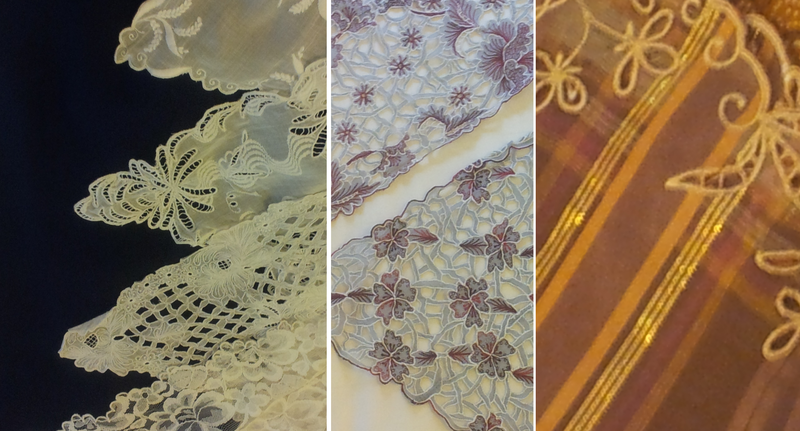 Here are her lace tops, which I wear over my work pants and skirts, or simply as part of a Peranakan sarong–kebaya set. 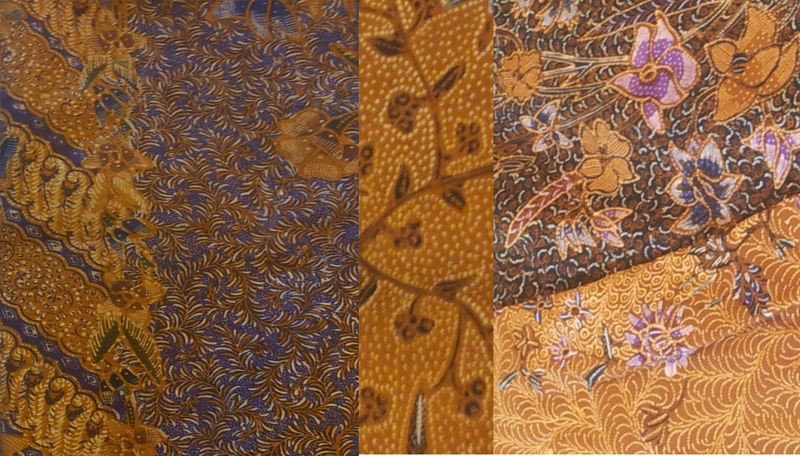 And here are the beautiful batik panels which I can fold this way or that to make whatever evening ensemble I feel like. But I’m happy. It’s effortless cheap I’m contented with. Ok, ok, I admit I have a thing for small shiny objects. But even those didn’t cost. The good stuff came from Grandma’s cupboards too. 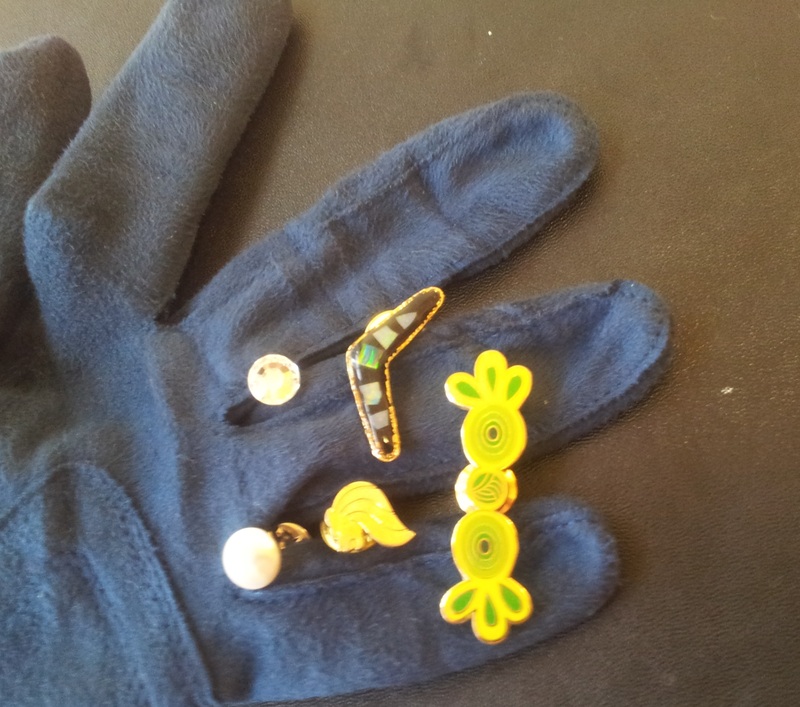 As for the everyday things – they’re hat pins I pick up on my travels which I use to pin up Grandma’s tops. So Kathleen, in answer to your question – What’ do I look for in clothes … Good basic stuff,low cost accents, and great no-cost antique workmanship. What is there from your heritage that you put on your body? What’s hiding in your Grandma’s or Mother’s attic that you can take out and make your own? To remember them by? Audrey I love your grandmothers embroidered tops, vintage is beautiful. I love wearing black, yes I know its not a colour but it is my thing, my daughter is starting to get a liking for it as well, oh well can’t say I blame her. I admire Kathleen for taking on the challenge of not buying clothes too. Very brave and could save you lots of dollars. Do you have vintage things Kath? When I’m in Oz, I’ve found that thrift shops are a great place for me to pick up little jewelry accents as Christmas presents for family. We don’t have that here. I love anything second hand, mostly in furniture that we do up or repaint. I like to use recycled stuff. Love vintage jewellery too but I go to the second hand stores in search of trinkets, old tins and old boxes and old glass bottles are my thing. Thanks for the writing prompt Kathleen. I was a bit stuck what to post after all those “travelling” blogs. It’s good to come back to homeground. Yeah, all that Peranakan stuff is hard to come by now. I usually only wear one thing — so a plain t-shirt with the sarong… or as I said, I pin up the shirts and wear them under a suit. After recently moving, I must admit I concluded I have way too many clothes. As a retired person, how much do I need? I must stop this madness of shopping. I even have too much underwear! So I have not bought anything in 2 months, an eternity for me….hope to keep it up for at least another 4-6 months. I’m not sure I could last a year. I will continue to try one month at a time. Keep us updated how your clothes diet’s going. I would love to be brave enough to do this…….I have to say though that it does rather depend on what sort of Grandma’s wardrobe your looking at: One of mine was a huge Yorkshire battleaxe who didn’t so much wear clothes as wrench them into submission, and the other was teeny weeny, sparkly and so synthetic that she was positively charged with residual static electricity if you happened to unexpectedly brush up against her chiffon and nylon…….I wouldn’t be able to leave the house for a year if I tried this with either. 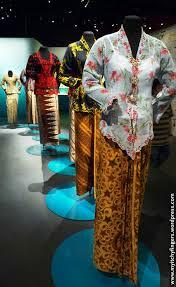 Wistfully wishing I had inherited some beautiful Peranakan clothes though! What powerful images – a Yorkshire battle-ax Grandma wrenching clothes into submission and a teeny weening tinker-bell one sparking static!!! Yup, Nanna… these easy Peranakan blouses and strips of clothe are much easier to fit into than fitted European clothes. Honestly, you could not have found two women as opposite in build, height, or personality as my Grandmothers – I have a very mixed bag of genes to work with!